AN alert resident who uses the MyDistress application helped police nab a suspected burglar on Saturday. The suspect, in his 30s, was arrested while hiding in a manhole at Section 8, Taman Serdang Raya. Serdang police chief ACP Abdul Razak Elias said that in the 2pm incident, two policemen — Constable Chandra Junus and Constable Fairuz Yusuf of the Seri Kembangan police station — spotted two men on a motorcycle behaving suspiciously in the Section 7 housing area. “When they approached, the suspects abandoned the motorcycle and fled in different directions and the policemen lost their trail 1km away,” said Abdul Razak. The break came when police received a MyDistress alert about a man hiding in a manhole in Section 8, responded to it immediately and apprehended the suspect after a scuffle,” he said. Abdul Razak said that although the accomplice escaped, police seized an iron rod, a grill cutter, a necklace and a parang. Checks showed the suspect was a drug addict with a criminal record for robbery in 2007. 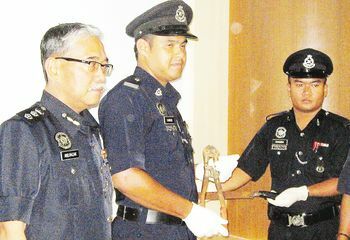 Abdul Razak said the duo, from Kepong, were believed to be involved in at least four burglaries in Taman Serdang Raya.